It’s a good news/bad news situation in Edmonton right now. First, the good news. Oilers forward and rookie sensation Connor McDavid is apparently “weeks ahead of schedule” in terms of his recovery from a broken clavicle. While there is no official return date as of yet, the word is that he could be back in the lineup by mid-January. That’s a good deal earlier than the mid-March projections originally released by the franchise. The lack of soft issue injury is a very important thing here because it assists in the overall recovery process after the surgery. McDavid had a plate and screws installed to repair the broken clavicle and the timeframe at that point was four months on the shelf. McDavid broke his clavicle on November 3 and the Oilers have been 2-6-2 since then, which suggests that this kid already means a lot to the franchise. Having him around certainly provided a boost that could push Edmonton beyond the tiny moral victories they’ve been getting lately. Forward Nail Yakupov is expected to be out two to four weeks after suffering an ankle sprain. 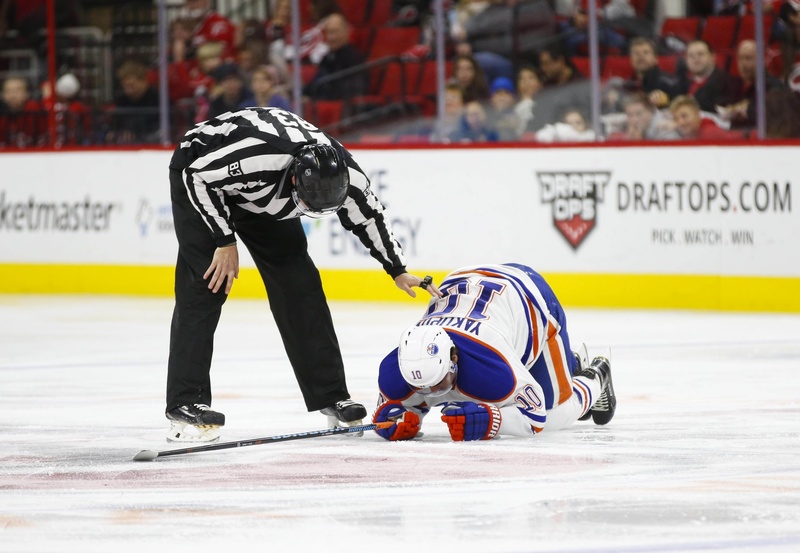 The injury happened when linesman Matt MacPherson fell on Yakupov’s leg on Wednesday night during a second period faceoff. It was one of those freak accidents and Yakupov wasn’t able to get off the ice under his own power. Yakupov had been struggling for the Oilers as of late, having not found twine in the last 16 games. He had two goals and a dozen points in 22 games and had just registered his 100th career point earlier on Wednesday in the game against the Carolina Hurricanes. The Oilers went on to lose by a final of 4-1. Losing the 22-year-old Russian will sting, no question about it. Even in a slump, Yakupov is capable of bringing something to the table. He’s not a point-per-game player, of course, and Edmonton is looking for their number one draft pick from 2012 to find that extra gear he had in his rookie season. But many in the Oilers camp believe it’s still in there somewhere. If not, Yakupov could be packaged up in a deal. For now, they’ll have to make do without him for a bit. They’ll weather this storm, like all the many, many others.